Arya took her first airplane ride yesterday. 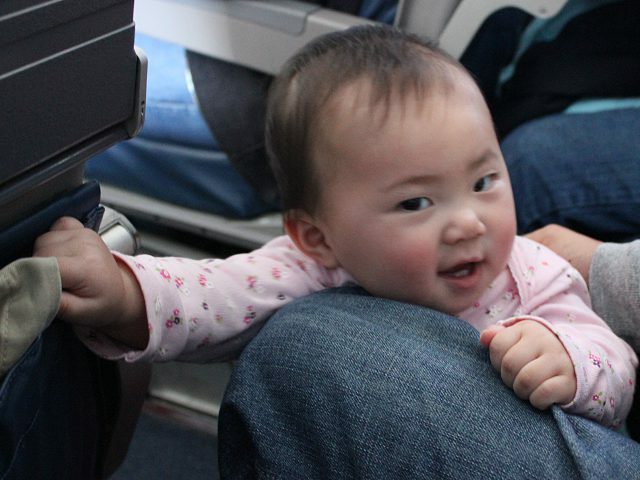 Baby’s first airplane ride was a lot more stressful for her parents than for her. We were worried about the entire process of getting to the airport, clearing security, and riding on the plane. Arya thought the entire adventure was a whole lot of fun. Both Mommy and I started worrying from before packing for baby’s first airplane ride and we didn’t stop until we finally got off the plane and collected all our luggage. Even though her first time at the airport went relatively smoothly, we were still concerned about the boarding process. Since there are different airline rules on flying with an infant depending on the carrier, I made sure to confirm that we would be allowed to gate check both the stroller and car seat on both legs of our trip. As we were flying during the holiday season, we expected the plane to be entirely full. We had reserved a middle seat and a window seat near the back of the plane and the check-in screen showed the seat next to us as being occupied. Sitting as far in the back of the plan as possible was a great idea for our baby’s first time in an airplane. Being close to both the plane bathrooms and the extra space near the flight attendants added an extra level of comfort throughout the trip. It also helped to have stuffed our diaper bag full of every possible item Arya could need on the plane. We had plenty of formula, cereal, diapers, wipes, toys, empty plastic bags, water, cups, bowls, spoons, and two changes of clothes. We even prepared easily-accessible changes of clothing for us in case baby had a messy accident during takeoff or landing. Ironically, after all of our preparation, Arya slept for over an hour from gate departure until we were above cruising altitude. We also lucked out since the gate agent was able to place us next to the only empty seat throughout economy. After Arya woke up she proceeded to drink a bottle and play with us just as she normally does at home. She also thought it was so fun to stand in the aisle and smile at all the other passengers around her. Thankfully all of them were friendly and didn’t mind a baby staring at them within close quarters. Arya also enjoyed the snacks provided as part of the beverage service. Peanuts post a choking hazard and she can’t bite hard pretzels so we requested cookies so that she could nibble on the food she saw us eating. The soft, gingerbread biscotti cookies were perfect for baby to eat since she could gum the cookie into small pieces and her saliva broke down the pieces even further to enable her to swallow them. I was surprised that the airplane lavatory actually came with an infant changing table which made changing diapers much easier than if we would have had to struggle in the seat. We were both worried about the potential for a messy disaster, but biggest mess came from the cookie crumbs that Arya got all over her face, clothes, and the seat. Baby’s first airplane ride went far better than I expected. Not only did she not have any accidents or tantrums, but Arya actually had fun the entire time. She didn’t even seem to be affected by the descent as she spent the whole time staring out the window at the clouds. We can only hope that the rest of baby’s first trip to Las Vegas goes as smoothly.